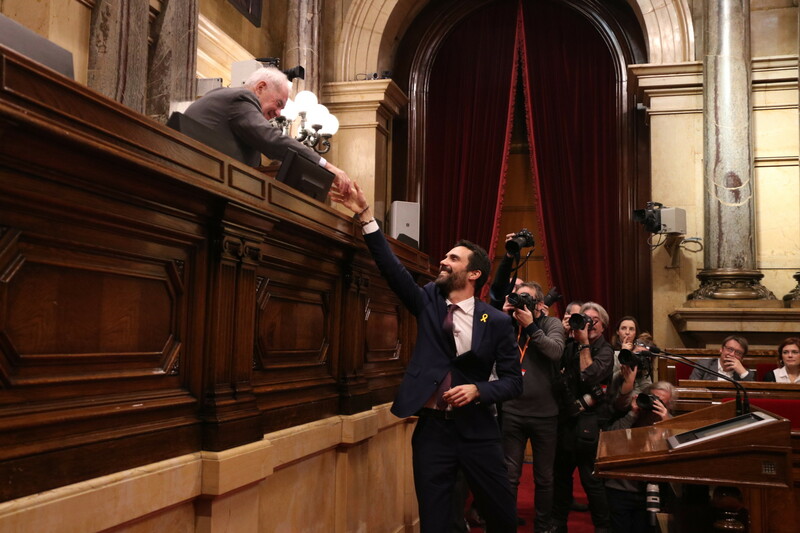 At 38 years old, Roger Torrent became the youngest person to be elected president of the Catalan Parliament on Wednesday. As an MP for left-wing Esquerra Republicana, his candidacy was backed by all pro-independence parties, which together hold a narrow majority at the chamber. He is taking the post in a crucial moment for the institution, right after an election imposed by the Spanish government, which threatens to maintain direct rule in Catalonia if pro-independence parties make a unilateral push for a Catalan Republic again. Torrent’s stunning rise has been possible in part because his predecessor, Carme Forcadell, stepped aside due to the charges she faces for allowing the declaration of independence last October. She spent a night in prison and was released after paying a 150,000€ bail. Torrent takes this post totally clean, but knowing that the Spanish prosecutor will have an eye on him. "We know, and they also know, that Esquerra Republicana is the only guarantee of facing and stopping the monarchic bloc of Article 155"
Unlike Forcadell, a grassroots activist who came to fame as the impassioned president of the Catalan National Assembly, Torrent is a party insider, being a member of ERC since he was 19 years old. He studied political science at the Autonomous University of Barcelona and gained his first political post at 20, when he became a local councilor at his hometown, Sarrià deTer, near Girona. At 27 he became mayor, a post which he managed to keep in subsequent elections until Wednesday. Since Parliament presidents can’t hold any other post, he will be expected to leave the office after more than 10 years. Torrent rose to prominence during the campaign as one of ERC’s most visible candidates. “We resist and we persist because we know, and they also know, that Esquerra Republicana is the only guarantee of facing and stopping the monarchic bloc of Article 155,” he told supporters at a party rally. Previously, he was a spokesperson for Together for Yes, the 2015 electoral coalition encompassing the two major pro-independence parties, ERC and PDeCAT. Torrent’s first decision as Parliament president will have great consequences: whether to accept Carles Puigdemont being re-elected as president from Brussels. Torrent recently stated that this was a technical matter, and that whatever the criteria of Parliament lawyers was, it should be respected. Last week, Parliament lawyers issued a non-binding report stating that regulations did not allow Puigdemont to be elected president at a distance.